I’ve had to make a sad decision about this blog. the Saturday… Just Saying post. After seven months I do not have the traffic or engagement needed to stoke the blog fire. In light of this, the blog does not make sense and I need to be dedicating as much time as possible to my novel writing. I really enjoy the sayings and making the art for Saturday Just Saying so I’ll continue it. I hope you continue to enjoy the Saturday… Just Saying posts. I really appreciate my followers, especially family and friends who would normally never read a blog or do not share my enthusiasm for the subject mater. Where is Monday’s normal post? Just in case you missed the post or forgot, Monday’s, What are You Reading Today post will be featured bi-weekly on Tuesdays alternating with Top Ten List. I’ve been stressed, not reading, or working on my novels in progress so I had to simplify my life. Eliminating one post a week is one step to achieve this. 😦 I love creating posts but I have to tend to my life too. The posts might look brief and simple but each post takes me several hours. I go that extra mile on each one. I research facts about every topic, book, and author mentioned, create links to books, authors, and sources. I create my own artwork. When I use images from others, whole or in part, I research the licensing to be sure I can legally and ethically use the work and, if so, how they must be cited. Most bloggers use generic images and a small percentage out and out plagiarize* whatever they want. 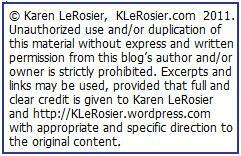 Posted in Blogging, K LeRosier W.I.P., What are You Reading Today? As of today I been blogging for 6 months. My blog and I got our birthday gift when total blog visits reached 2000 on the eve of our six month blog birthday. Many thanks to those who answered my plea and helped with the last 37 visits needed (I got over 50 visits in answer). Many thanks to all the people out in the bloggosphere who have visited the blog. 2000 thanks to those who’ve commented. A million thanks to Bobbie who is my top commenter. I’ve posted 78 blogs, an average of 13 a month. Visits to the current post gets counted as visits to the home pages. This statistic primarily counts visits generated from search engines. Thank you and please visit often! I’m eagerly waiting 2000 more visits! I’m between books which rarely happens to me. Lately I’ve been too busy and stressed out to focus. Life gets in the way sometimes. Worse yet I haven’t been writing, working on my novels for a long time. This is way beyond writers block. The blog takes much of my writing time and lately I seem to be running dry on top ten list idea. To nudge me beyond this slump I’m going to simplify my life a bit. Tuesday’s Top Ten List and Monday’s What are You Reading Today? will change from weekly to biweekly features on alternate weeks. Both will be posted on Tuesdays. When I pick up my Kindle to read, I gravitate to Mahjong Butterfly. It’s not that the game is that much fun but it is just right for my attention span lately. The game is $2.99 in the Kindle Store and is a good for killing time. Dog Days, Book 4 of Diary of a Wimpy Kid by Jeff Kinney. Posted in Blogging, Books, Kindle eReader, The Kindle Store, What are You Reading Today?